Give Back is crowdspring's way of helping worthy non-profit and charitable causes around the world when those organizations need design help but cannot afford it. For these special projects, no monetary awards will be given and crowdspring will waive all fees. Crowdspring will help each organization post their project. Together, we will collaborate to help those who are less fortunate. Give Back projects will work just like standard projects, including contracts, wrap-up, notifications, etc. We will find ways to recognize winning designers in Give Back projects. We'll also ask the winning designers in Give Back projects to propose other worthy non-profits and charities that can benefit from this program. We hope that in this small way, crowdspring and our community can help non-profits and charities around the world. Gospel Run is a 501c3 public health organization. Our vision is to close the health gap, rewrite the health narrative in black and brown communities, and inspire a culture of prevention and possibility. Launched 6 years ago in Chicago, we have inspired thousands of sedentary families to get active, and to believe that change is possible for themselves and their health lives. We are building a national health movement to eliminate health disparities and disrupt the cycle of disease that exists in far too many of our families. African-Americans suffer disproportionately from nearly every major chronic disease, and most of these diseases are preventable. We mobilize the faith community to create a culture of health, and we focus on combatting sedentary behaviors - one of the leading causes of death and disability. 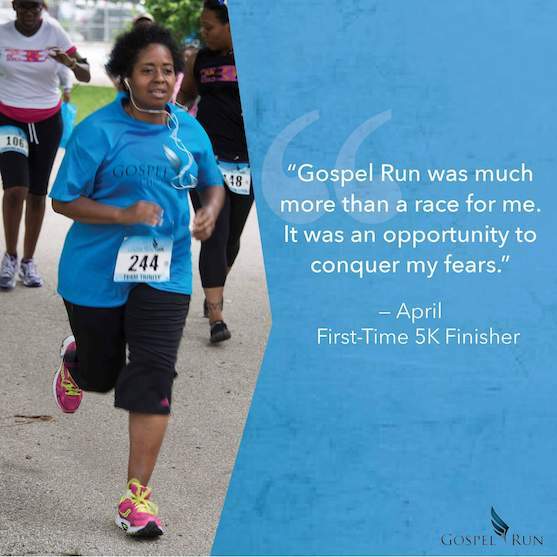 Our annual signature event is the Gospel Run 5K Run/Walk, and to date, over 100 teams have been formed under the Gospel Run banner, some as large as 400 from one church. The event platform serves as a vehicle for health promotion and a welcoming place for first-timers who struggle to feel comfortable and supported in taking steps toward their own health. Below is a video from a Gospel Run 5K. And here's a photo of one or our runners. The color of the shirt is navy.